After some time living on the West Coast and touring with the New York-based Beach Fossils, Smith returned to the East Coast last spring, moved into a cheap apartment in Brooklyn with no running water, and found the city had continued on without him. “I could have called my friends to hang out, but I felt invisible,” Smith says. He stayed home listening to spacious free jazz. Writing songs seriously gave him something to talk to other people about so, as social stimulus, he booked a show. DIVV was born and a band was assembled, featuring onetime Smith Westerns drummer Colby Hewitt, grade school friend Andrew Bailey and bassist Devin Ruben Perez. 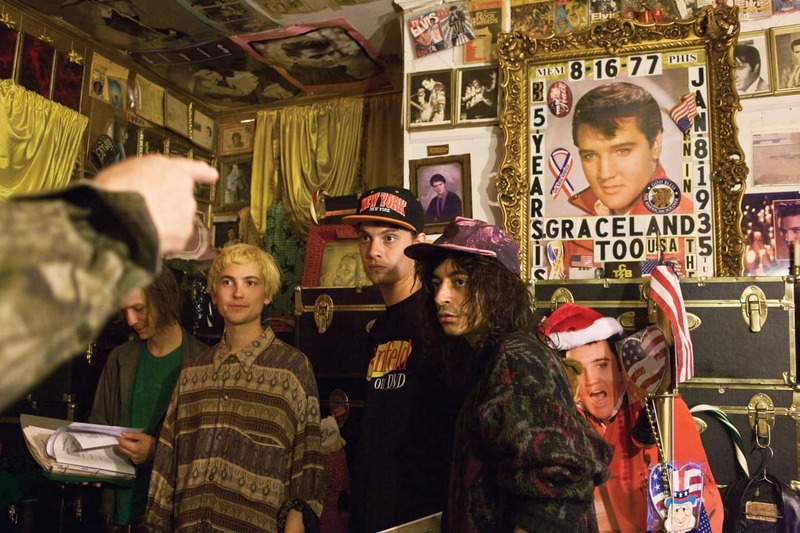 The show turned into an unofficial residency, with DIIV playing house band around DIY venues like 285 Kent and Shea Stadium, sometimes three nights a week. “New York is like the end of the world,” says Perez. “All the partying, the drugs, they’re all in New York. It’s like running away and joining the circus, all these shows and freaky people and things to do.” A NYC native adopted by the Brooklyn scene after his parents abandoned him at 16, Perez had booked shows, worked the door and played at home, but he had never actually been in a band before DIIV. “Sometimes you just find compatible people. We don’t have to talk, we just know what’s bothering each other,” he says. Smith designed DIIV to travel well. “I wanted a band that would be really easy to set up and play. There’s nothing that can go wrong—we can play a basement or Webster Hall, and everything would be the same.” But the band’s debut, Oshin, on Captured Tracks, is not just a screw-around good time. “The whole lo-fi explosion was cool because it allowed people to get their music heard and new songwriters to emerge,” Smith says, “but those records won’t last.” Oshin may be unabashedly guitar-driven, but it eschews traditional rock structure. Much of Oshin is just finely textured, forward-moving sprawl. Smith places the songs into three categories: “happy, Kraut and sad,” and sequenced the record to conclude with a string of the latter, one heavy-hearted jam after the next. Whether or not it’ll encourage kids to pick up guitars in 2030 is yet to be determined, right now it’s perfect for lying on the pavement, staring down at your sandals and back up at the sky.